Giving us a but of a jump on next month's premium footwear releases from Nike Skateboarding, today brings us our first shot at this all new "Wheat" SB Stefan Janoski Mid. Ready to be skated, the always dependable SB Stefan Janoski Mid arrives in a natural-toned full suede upper. "Wheat" suede builds the entire upper on these, while obsidian is seen accenting on the Swoosh, laces, tongue badge and piping throughout the upper. A vulcanized gum sole is utlized below to complete this latest look for the SB Stefan Janoski Mid. 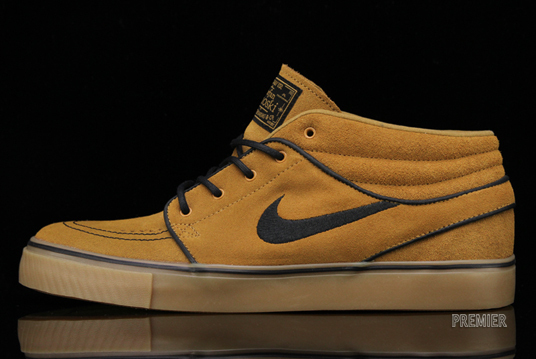 The "Wheat" SB Stefan Janoski Mid is now available at select Nike SB accounts nationwide, including Premier in Michigan.